London, UK – Following the November 2015 release of the critically acclaimed CD “Madison Park” by The RAZ Band, Gonzo Multimedia has just released “The Best of RAZ”. This career spanning CD takes the listener on RAZ’s thirty two year musical journey and features songs beginning with Raz’s critically acclaimed 1984 debut record, “Criminals Off The Streets” through Gonzo’s 2015 release of “Madison Park”. This 19 song CD also includes songs from the albums, “The Best of L.A 1987”, the “RAZ” album, “1988’, Raz’s cassette EP “Listen” produced by Joey Molland, the “Tough Love” CD produced by Joe Vitale, the “It’s All About Me” CD produced by Michael Raz, Jeff Hutchinson, Joe Vitale & Joey Molland, plus 2 bonus tracks recorded, Live in 1984 at the legendary Los Angeles nightclub, Madame Wong’s West. Guest performers include Joey Molland (Badfinger), Joe Vitale (Joe Walsh/Crosby, Stills & Nash/The Eagles) Stu Cook, (Creedence Clearwater Revival), Carla Olson and Marc Droubay (Survivor). Rock Legends “The R​AZ​ Band​” Releases New Album Featuring Badfinger’s Joey Molland and Drum Legend Joe Vitale! 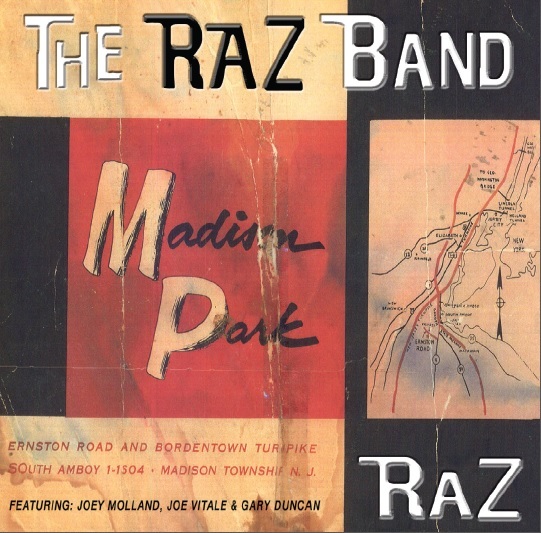 ​This is ​the first Raz ​album created with music legends Joey Molland (Badfinger) & Joe Vitale (Joe Walsh/Crosby, Stills & Nash/The Eagles) as ​full ​band members. While​ they’ve been recording​ together​ for years, this is the first album that was planned to be a​ RAZ​ ​Band album and not a RAZ album, hence, “The RAZ Band”. ​The catalyst that led to the Madison Park album was a ​RAZ ​show​ at The Whisky​ A Go Go​ in Hollywood. Their guest performers were Joey Molland,(Badfinger), Gary Duncan,(Quicksilver Messenger Service) & Carla Olson, (The Textones). Raz​ recalls​, “Whenever Joey Molland ​came to​ LA we ​would ​record​​ RAZ songs. This time we recorded Joey’s great song, ‘Love Me Do’ from the amazing Badfinger album ‘No Dice’. To add to the fun, Gary Duncan was able to join us for this ​recording ​session. ​”When ​Joe Vitale ​came ​back​ to ​LA, ​​ RAZ ​went​ into the studio to record. “We recorded a new song that we wrote, ‘$1.50 For Your Love’. ​​After cutting the back tracks with scratch vocals, Vitale said, ‘This song is a hit song, and let me tell you, I know what a hit song is’. And of course he does, he co-wrote ‘Rocky Mountain Way’ with Joe Walsh. “A couple days later we ​went​ back into the studio with Vitale and recorded another one of our favorite songs, ‘Shoot ‘Em Up’. This is from Joe Vitale’s great album, ‘Roller Coaster Weekend’. ​The ​RAZ ​Band ​features Michael R​az​​ Rescigno​ on vocals & guitar, ​Jeff ​ ​Hutc​h​ Hutchinson on drums​ & vocals, Jim Manzo on bass​ and vocals​​, Joey Molland ​on guitar & vocals, and ​Joe Vitale on drums, keyboards & vocals. RAZ ha​s​ opened ​for​ Badfinger, Missing Persons, Berlin​, Marky Ramone, Bill Ward, Iron Butterfly​ and others​. ​Raz ​co-​wrote​ ​songs​ ​with Bobby Hayden​ ​that appear​ in the​ 2015​ bio movie, “The Life, Blood & Rhythm of Randy Castillo”. ​Raz​ was musical director for ​the Universal Wrestling Federation ​professional wrestling league, and ​wrote ​theme ​songs for ​the ​wrestlers and​ music for the TV show. “Let me tell ya, some good stuff here. I really enjoy RAZ!” – Kelly Cox, KLOX 95.5 FM L.A.
​In early 2016 ​Gonzo MultiMedia will be releasing “The Best of RAZ”​. Followed by the release of “Razfinger” in the spring. The RAZ Band with Joey Molland & Joe Vitale are planning to perform in Englan​d​​​ and elsewhere ​in 2016 and record a live CD and DVD.